Mi, on Thursday evening, we were chilling at home as usual. It was Independence day and a holiday. I had some vague intention of writing a post about Freedom, but real life intervened and I let it flow. Sometimes we just have to cut out the external noise and enjoy ourselves, no? And we did. It was a rather cozy day. Heavy rains outside. Of course we stood straight when the National Anthem was on. Then we listened to a lot of lovely patriotic songs. You know Sury. I made semiya (vermicelli) payasam (rather a lot – have some still tucked away in the fridge). Yes, I made it thick so as to add milk to bring it to the right consistency and warm up before indulging. Yes, I roasted everything nicely to a golden brown before cooking. And yes, yes, I added freshly crushed cardamom. Wait, I know what you’re going to ask me. Did I fry the raisins so they became turgid little fellers? Yes, Mi. I did. So many years of being your apprentice, naturally I would have learned it all by osmosis, no? Okay, we’re digressing. As usual. Back to the future present. So as usual we had a rather sumptuous holiday meal consisting of kundru curry, tomato sambar (yes, like that! – and yes, I chopped up the coriander stalks and added them for flavor and iron, go on, pat my back! ), guacamole (yes, I am hooked to avocados, better known as butter fruit. Yummy. Wish we had got these earlier, you would have loved it), capsicum salad, cucumber salad, papad, variety of pickle, curd, rice and love, of course. You remember how we loved holiday meals! Sitting together in your room, and enjoying the buffet-style meal. At the end of it, you would always whisper to me, saying what a good chap Vidur was about food. So he didn’t mix the sambar and rice and curd and rice like a good Tambrahm, but what the heck. He eats it all separately, so how does that matter. He is still not a fan of yogurt, but will not fuss over buttermilk occasionally. After a leisurely lunch, we settled down to do our thing. During tea time, I made the semiya payasam on a whim, actually. Then Vidur joined me in the living room where we played some songs, chatted intermittently as he busily sketched and I caught up with my work. “Eh, what?” I thought. Then I was pointed to the Indiblogger link where it was all happening and I swear you could have knocked me down with a feather (at that moment, mind you, not always) – do you see what I saw? Predictably, I started crying uncontrollably. So much for you thinking I rarely shed tears. Ha! I am pretty much mushy these days. 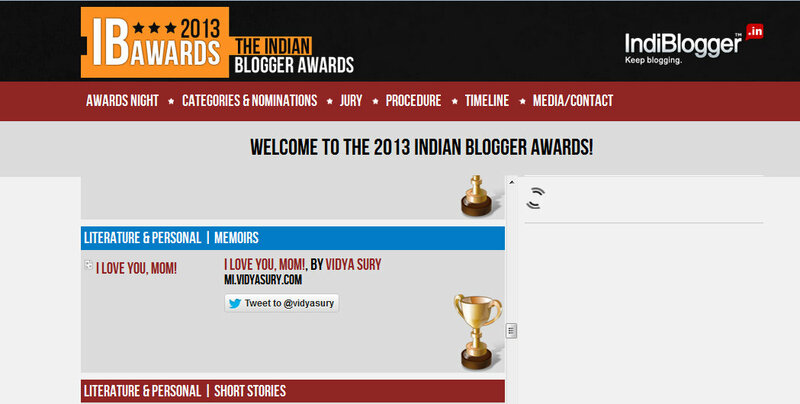 Coffee With Mi is the winner in the Literature & Personal Memoirs category of the 2013 Indian Blogger Awards. Yes, Congratulations to you. Without you, this blog may not have existed. Of course I am deeply grateful to all those who visit, read and comment. So that’s our big news of the week. I have so much to say to you all the time, I’ve also taken to writing a diary, to keep pace with my thoughts. I promise you, Mi, that book will not remain a dream. And now, let us enjoy this beautiful song,”Aaduvome Pallupaaduvome” by D K Pattammal – you loved it when I sang it for you! I have tearful memories of you teaching me “Thayin Manikodi Pareer“. We’ll listen to it next time when I find an audio by D K Pattammal. When we sang it together, my chest would burst with emotion. You know what is endearing? That V loves these songs too! I have loving memories of how you relished wearing your off-white saree with the tricolor border! Despite what followed after that, I can never forget how you started this blog and it’s wonderful how faithful you’ve been to it. The award is truly well deserved, Vidya and like I told you, your Mom would be so proud. I hope that book comes out soon – it will be a hit. PS: I love how the raisins become plump little fellows! Yes! Me too! Especially when the orangish ones are mixed with the black ones! Thanks again! Congratulations on the IBA Award Vidya! Vidya, congratulations. Your blog truly deserves to win. I love the way you bring your mom to life with your reminiscence and lively conversations. Such beautiful memories. Thank you, Suzy. I appreciate your kind words, always! You might suddenly find that the payasam is not as thick as you thought it was. A little plump raisin was heard mentioning about someone’s tears of joy mixing up with it all, on hearing your news…..
Congratulations on a very very deserving win, and will be looking out for your book 🙂 !!! Thank you so much, Suranga. Chances are very good that the little plump raisin is telling the truth. Thank you, Ravi. You are one of my favorite encouragers! hearty congratulations to you. Telepathy. You felt you will get the award and celebrations with a sweet dish. Vidya you truly deserve it. Congratulations Vidya! Enjoy the accolades and keep on sharing your lovely self. This is fantastic! Absolute pawfection. Hearty congrats, my human friend. It seems when it comes to celebrities, you are my latest favourite celebrity. A peaceful, pawsitive rest of your weekend. I love this blog of yours and your conversations with your mom. I miss my mom terribly too. You are a lovely person, Vidya and mom would have been so proud of you. We all love you! Congrats on a well-deserved award! Let’s have a party when we meet next :). Thank you, Rachna! Moms are precious! Yes, let’s have a party when we meet next. I also have some something somethings for you. 😀 Hugs! Many many congratulations!! You know I’m recent reader..nah…follower to your wonderful blog. Your conversations are so pure n just touch all of us right there…it brings about a warm glow in my heart…always!! Congratulations Vidya! I’m not surprised!! As you know, I’m a regular reader of your other blog and I need to come visit here more often.